Cartridge Save's mission is to save you as much money as possible on HP J5520 inks. Sooner or later your HP J5520 will run out of printer ink, and when it happens you'll realise that fresh HP J5520 ink may be costly. Fortunately you do not need to bother about shelling out the steep costs you'll uncover on the main street because now at Cartridge Save you can pick up all the HP J 5520 cartridges you'll ever want at little cost. Start saving money on your ink by purchasing online at Cartridge Save! Why pay more to get the J-5520 original cartridge or J5520 compatible ink in the main street when it is easier to save money shopping online with Cartridge Save. You enjoy full satisfaction by ordering OfficeJet J5520 ink cartridges from us seeing as each one is protected by a hassle-free money back guarantee. Take into consideration that each and every order also has free delivery, mostly arriving at your doorstep next day! Suitable for home offices and small businesses, the all-in-one HP Officejet J5520 has a built-in telephone and is capable of printing, copying, scanning, and faxing. It uses drop-on-demand thermal inkjet and has a duty cycle of 1000 impressions per month. This printer is rather bulky and lacks a few useful features, though. The HP Officejet J5520 has dimensions of 235 x 435 x 418 mm and weighs almost 6 kg. The telephone is on one side of the printer, and there is an auto document feeder and flatbed scanner on top. The input tray has a capacity of up to 100 sheets while the output tray has a capacity of 50 sheets. There is also an organised control panel with a mono LCD display on the printer. This device is a convenient and economical choice for offices with small budgets. It boasts low running costs, and the initial price is low. The print quality for both coloured and black prints as well as the scan and copy resolutions are more than adequate. 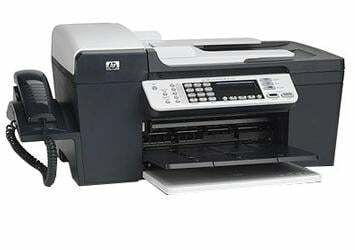 Because it is cheap price, the HP Officejet J5520 does not have a coloured LCD and lacks network connectivity. It does not support PC-free printing and does not even have a USB or memory card reader. Print jobs come out decent, but print speed is average.